modeling | Joyeuse errance ! 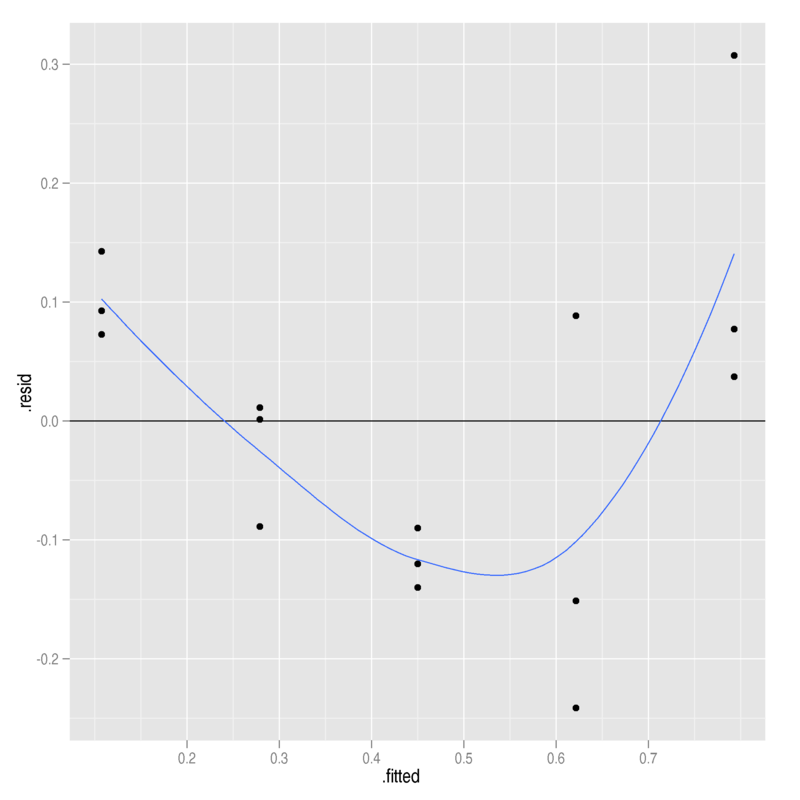 In this post, I explicitly derive the mathematical formulas of the linear model, and show how to compute them in practice with the R computer program. The first post of this series is available here (sorry, it’s in french): « le modèle linéaire (1) – présentation ». We want to analyze the relationship between the rate of DDT in fishes (variable to explain ) and their age (explanatory variable ). And for this, without any hesitation, we’re gonna use R.
From this, we see that the older the fish, the higher its rate of DDT. Moreover, the older the fish, the more variable the rate. 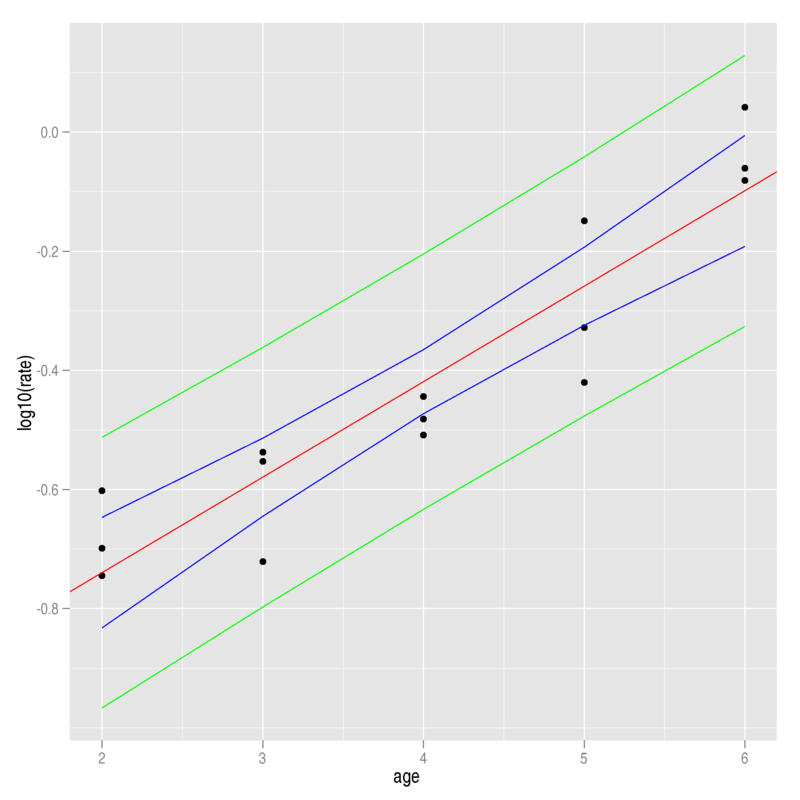 We can propose hypotheses about the relationship between age and rate, but we cannot conclude for sure of which kind it is. That’s why we need a statistical model, i.e. a formal way to quantify the uncertainty in the measurements and our confidence into several hypotheses describing the mechanisms behind the phenomenon under study. « i.i.d. » stands for « independent and identically distributed ». one left unexplained, , the random part. is not a linear model. Now, for each parameter again, we should compute the second derivatives of the likelihood and check that they are positives. This is to be sure that the formulas we obtained above with the first derivatives truly correspond to maxima and not minima. But I’m feeling a bit lazy here… Whatsoever, it works. The estimators and are linear combinations of independent Gaussian variables, the , thus both follow a Gaussian distribution: and . We now need to derive the expectations and variances of these distributions. This new term is useful because it is not random, which facilitates the derivations of expectations and variances, as you will see below. The estimator has no bias: . The estimator of is biased: . Also, (i.e. the square root of ) is also called the standard error of the regression. Thanks to the formulas above for , and , we can compute the estimations , and of the parameters , and . These estimations are thus also estimations of and . But how to estimate and ? Moreover, for each estimation, it is often very useful to compute a confidence interval. Such an interval indicates that, if we were to re-do the whole experiment 100 times, the true value of the parameter would fall in it 95% of the times (corresponding to a level ). where are realizations of , and the ‘s are quantiles taken from the Student cumulative distribution function. The difference between and is that is an unobserved random variable whereas is a residual computed thanks to the estimators and . As an estimation of the expectation, we have: . The prediction interval is always wider than the confidence interval but, as the estimation of by gets more precise (e.g. with more sampled data), the predictions will be more precise also. the error terms follow a Gaussian distribution. Basically, we need to look at the estimations of the error terms ( ) as a function of the predicted values( ). again with but these are different from model 1. The variance was stabilized but the residuals are still slightly structured. But let’s keep this model as, although the blue line is similarly convex as in the previous model, the y-axis has a much zoomed-in scale. Therefore, our final model is: with . To ease the equations, we will use . Now, the model is . i.e. 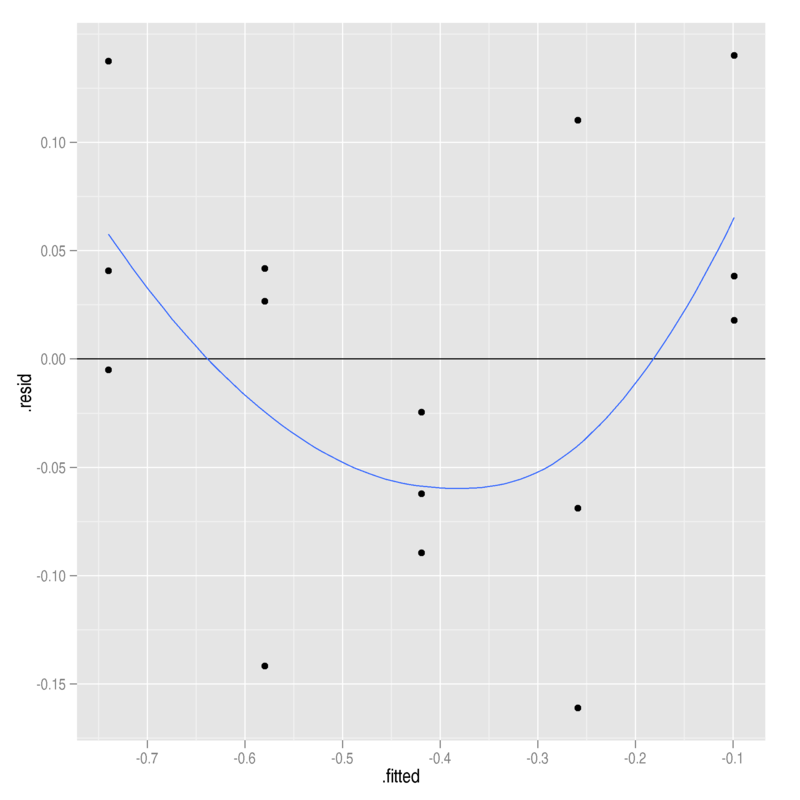 if is higher than the quantile of order from a Fisher law . The smaller the P-value, the the stronger the disagreement between the null hypothesis and the results of the experiment. Usually we reject when the P-value is smaller than . We obtain , , , and . These results show that the variability explained by the model is far greater than the residual variability ( and ). Thus, we can reject the null hypothesis and consider that there exists a linear relationship between the log of the DDT rate in fishes and their age. It is important to assess the adjustment of the model to the data as we may use it to predict the value of knowing the value of .For this purpose, we compute the R-square, , that corresponds to the proportion of the variability in explained by the model (in percentage). We obtain and . 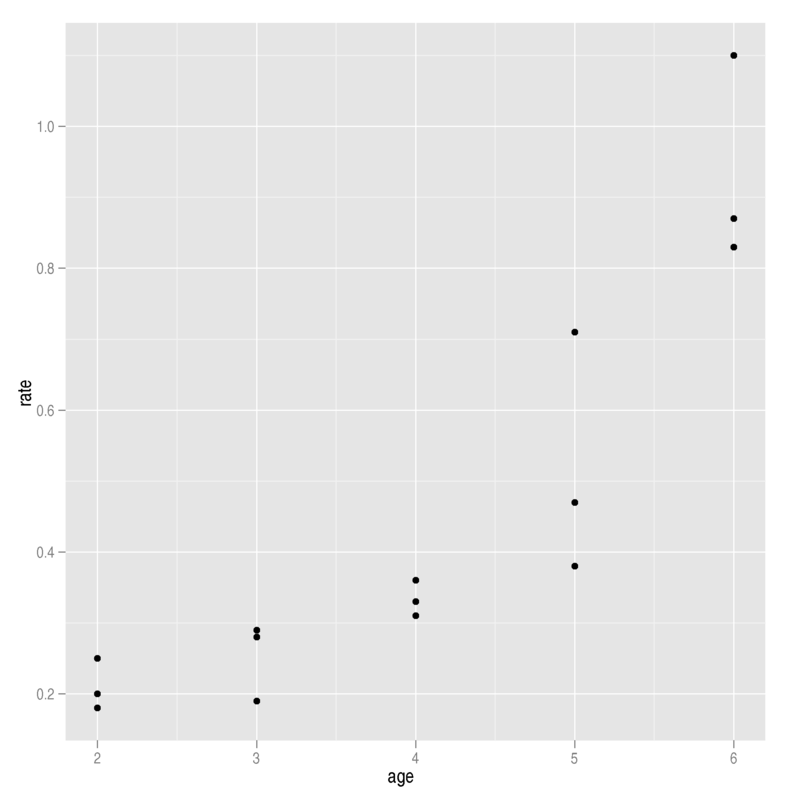 It means that 85% of the variability of the log of DDT rate in fishes is explained by their age. Know that and , we get , and . We get , , and . These values show that our estimates are quite precise. Although it seems almost certain when looking at the confidence intervals, we can still wonder if we can reject the null hypotheses according to which the and parameters equal zero: . Note that the test for is equivalent to the test made previously with . 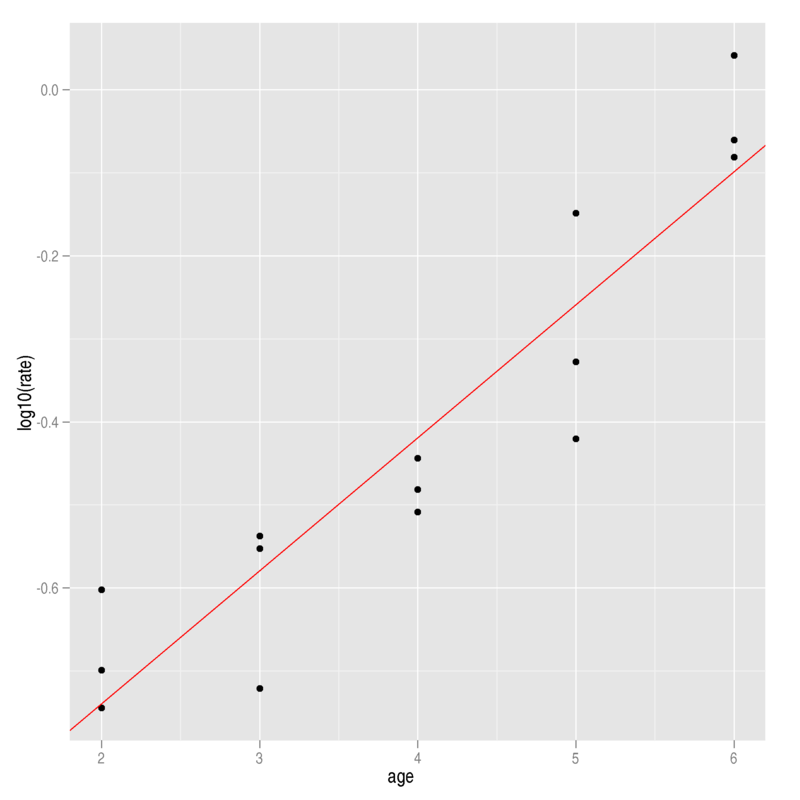 the log of the DDT rate for a fish is linearly linked to its age( ). And as , this is a growing relationship.